Lose heat through flue gases because of an excess of air. The goal of all companies that use industrial process combustionÂ should be to come as close as possible to the stoichiometric air-to-fuel ratio, the theoretical ideal in which just enough oxygen is available to completely burn the fuel. This ideal will never be realized because fuel and air wonâ€™t completely mix, meaning that excess air will always be required. But a combustion system thatâ€™s designed, operated, and maintained well is capable of keeping excess air at less than 10-15 % while approaching complete burning of the fuel. Most businesses that have old combustion systems and furnaces realize theyâ€™re inefficient, but awareness of the extent of the problem is often limited and thereâ€™s not enough concern to prompt capital investments in system improvements. In many cases, companies are already planning to replace the system in a few years, and thereâ€™s a feeling that itâ€™s a waste to invest in improvements. 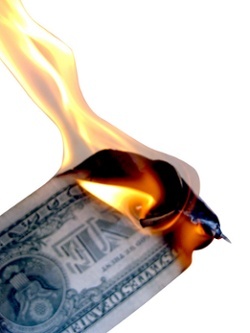 But meanwhile, money is â€œburning upâ€ in the heat (or more accurately, in the heat loss). When the air/fuel ratio is optimized, the resulting energy savings per unit of sellable product usually ranges from 5% to >25%! The energy savings over even a few years can be substantially greater than the cost of improvements. Before making improvements to a combustion system, key aspects of the process need to be measured by analyzing the temperature, oxygen concentration, and carbon dioxide concentration of the flue gas output. These are fundamental indicators of the systemâ€™s efficiency and the amount of excess air. Controlling the air-fuel ratio sent to the burners. Eliminating air leaks that allow ambient air to be drawn into the system. Controlling any makeup air that is used. Businesses wishing to tap into the savings possible by improving combustion processes can hire engineering firms that specialize in combustion systems to help with both efficiency measurements and with developing realistic solutions to improve that efficiency. Develop a current energy baseline, allowing us to track improvements. Provide detailed descriptions of energy inefficiencies. Offer solutions to the inefficiencies. Take advantage of partial funding opportunities from government agencies and utilities to reduce energy use and offset emissions. Provide simple ROI calculations, summaries of energy and emissions reduction possibilities, and recommendations to help in management decision-making. This process should fundamentally be the same whether you work with us, contract with another engineering firm with the necessary combustion and industry experience, or tackle the project in-house. The key point is to not accept an inefficient furnaceâ€”no matter what its age. The first step towardÂ this non-acceptance is realizing the full scope of the problem, and that begins by examining how heat is generated. In future blogs, we will examine further ways to reduce energy costs through heat containment and recovery. Image courtesy of Images Money, Creative Commons.